Never before have I girl-crushed this much on an actress that I've seen in ONE movie (no, I have no interest in The Hunger Games whatsoever- I'm bored by most fantasy genres and yawn at pretty much any action movie). But Jennifer is all that and some more. And she proved that both in Silver Linings Playbook and last night. I mean, that girl has Best Actress written all over her. Watch the entire scene - or better yet, watch the whole movie. You'll be glad you did. I can't stand it when she gets lumped in with the likes of the teenybopper vampires-werewolves-and-teen-magicians Hollywood gang, mainly because Jennifer Lawrence - please don't call her J-Law- is this completely brilliant actress. She should be put on the level of Anne Hathaway, Natalie Portman and the rest of the Oscar crowd. But at the same time, Jen's a normal girl. Not a Hollywood "I try so hard to seem like a normal girl, but really I only eat carrot sticks" normal girl, but an actual normal girl. One who says things like "I didn't fully pee my pants". One you could see yourself being friends with. Except, you know, she's the most gorgeous woman ever. And she doesn't even seem to care that much about it. ﻿I'd like to have a nice chat with the critic who considered Jennifer "too full-figured" to play Katniss in The Hunger Games (this is a movie I don't care at all about watching, by the way - have I mentioned that?). Quite simply put, I'd like to ask her what the hell she was on, and where can I get some. I'd also ask her if she's ever seen a human being look more perfect than Jennifer in last night's Dior gown. Or, as Jen herself put it: "it's Dior haute couture. I don't know what haute means, but they told me to say it." I think she pretty much eclipsed everyone else there. Including Charlize Theron, who is not easily eclipsed. I remember thinking, just after having watched Silver Linings Playbook, that when I was ten years old and I envisioned myself winning an Oscar, I was picturing myself being someone like Jennifer. "My" winning movie was supposed to be something like Silver Linings. I didn't believe she'd go on to win because that would mean that the Academy saw what I saw. But then she did win. They called her name and she was shocked. Not a Hollywood "I pretend to be shocked but really I totally knew I was going to win" shocked, but actually shocked. And what do normal, non-carrot stick, non-glossy women do when we get shocked? Well, sometimes we fall. And Jennifer fell. She fell in Dior haute couture. In front of millions of people all over the world (well, at least all over the States. The rest of us still can't watch the damn show). Of course, when I fall in the supermarket (shut up, it happens), Hugh Jackman doesn't rush over to help me up. 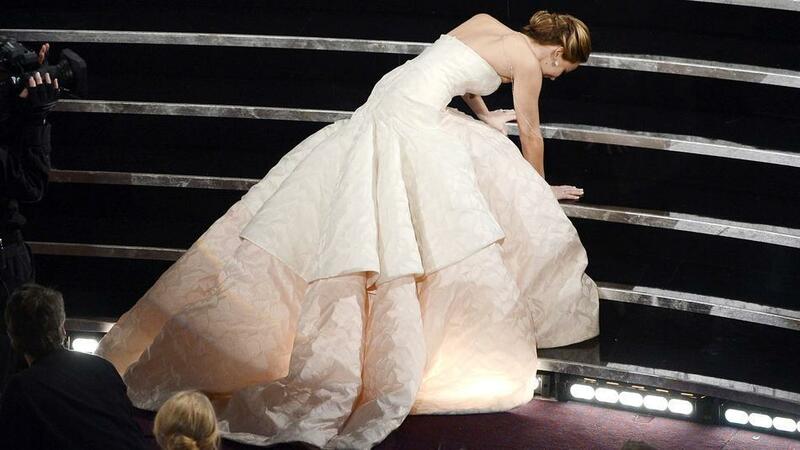 But aside from still being totally A-list even when on her hands and knees on a stairway, that was a moment when we could all relate to Jennifer. Who hasn't been embarrassed at a big moment in their lives? Who hasn't tumbled down stairs at the school concert, jumped in the pool in a white bikini that went completely see-through in the water, stumbled in front of their crush, fallen over drunk, walked into a glass door at Miu Miu...okay that last one might have been just me. But you get it. We're all clumsy sometimes. Even those of us who have kissed Bradley Cooper. What then almost moved me to tears was the way Jen handled herself after standing up, dusting off her couture and picking up her little gold man. As Hollywood's finest gave her a standing ovation, she said, "you guys are only standing up because you feel bad that I fell and that's really embarrassing but thank you". I LOVED HER SO MUCH at that moment. I wanted to rush onto the stage, interrupt her and say, "no, they're standing up because you are fantastic and your movie is beautiful and you deserve this so much!" Then I'd give her a hug. It was just so awe-inspiring to see that she didn't try and hide the fact that she was embarrassed. She didn't pretend like the fall hadn't happened. She didn't joke or laugh it off in an annoying, fake-authentic "I'm a real girl in Hollywood" way. She just said, "I fell and it was embarrassing." It's this realness, this being a real girl, that's what I love about her. Not in a fake, constructed way, like some other "I'm so goofy and funny" actresses that will remain nameless. And I think it's one of the things that make her one of the best actresses out there and will bring her more than one Oscar in the future. Oh, and one more thing: I want to watch The Hunger Games now. She rocks. 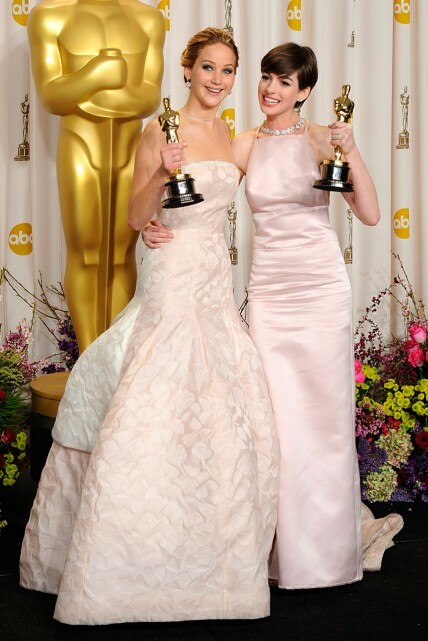 I was so happy she won, like my good friend had just won an Oscar. She is sooo relatable...and funny! love everything about her: because like you said, she is AMAZING but she is real. You have to watch Winter's Bone (the one she was nomitated for in 2011)! I really have to see Silver linings playbook because the opinions are so divided, people either love it or hate it! About the comment that she was "too full-figured", I've heard it and have no clue who said it, I don't think the critic who said it wanted to say she was "too full-figured" in a real life, for a normal person, but for the role she was playing. If you watch a movie, it totally makes sense. I have to add that i totally didn't like it, but then again I'm not a fan of that type of movies. You're probably right, but I'm appalled at the notion that an actress is chosen to play a role because of her body and/or appearance. I want to believe that Jennifer was chosen because of her talent and ability to bring the character to life. I don't even understand the need to bring her figure into the discussion. Love her and how real she seems. Fingers crossed she stays this way and doesnt succumb to the rest of Hollywood!